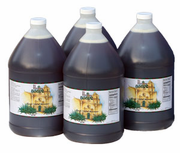 Premium Bulk Caramel Agave (4) 1 gallon bottles (NET WT 48 lbs) $0.14 per Oz. Tasting notes: A full-bodied caramel flavor. Rich toffee aroma with creamy buttery-caramel finish. Perfectly compliments Flan desserts, drizzle over baked apple or pears with cinnamon.